A neat, cosmopolitan city of shaded plazas and laid-back neighborhoods, Cairns serves as a popular base for exploration of the surrounding region and the Great Barrier Reef, as well as a center for watersport activities like surfing or waterskiing. The city has an easygoing, unpretentious atmosphere that makes it easy for visitors to adjust to local life. Much of the appeal of Cairns comes from its backdrop of forested hills and flanked by attractive beaches. Cairns is in Cairns Region. Take a look at our Australia trip itinerary maker app to refine the details of your trip to Cairns. 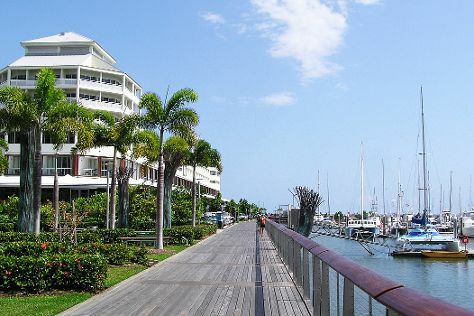 The gateway to Queensland's tropical north, Cairns is a laid-back city best enjoyed outdoors. Visit Cairns for the Great Barrier Reef and Wet Tropics World Heritage Rainforest, but don't miss the great things to do in and around town. You'll find brilliant cafés, bustling markets and plenty of beaches nearby. Relax by a resort pool or spend your days exploring this tropical oasis. International flights arrive at Cairns Airport, a 10 to 15 minute drive from the city centre. In Cairns you'll find plenty of activities to get your heart racing.